So, now onto happier topics! I have the sweetest Daddy in the whole world! He and my Mom have been cooking up a surprise for Dan and me and Geronimina. 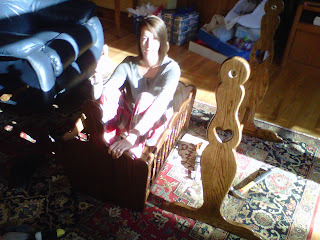 We didn't register for a bassinet, because a while back I asked Mom if she'd saved mine and she said yes. I told her I'd like to get it reupholstered and use it for baby girl, and she said she would take care of it. I was so excited that she'd kept my bassinet from when I was little, because normally Mom isn't a "keeper" - Dad and I are the pack rats of the family. So, the fabulous Marcy, who is also making our bedding, was going to reupholster the bassinet for us. Yay! Due to aforementioned complications that have arisen in the pregnancy (and bed rest), we had to change our Christmas travel plans so that we could be at home in Raleigh. This was our year to spend Christmas with the Baums, and we'd planned to go have Christmas with the Eakers after, but when bed rest was ordered, Mom, Dad and Sydney (and Dundee!) came to visit us in Raleigh. We were sad that we couldn't be in Charlotte and be with Katy and Josh, but happy that part of my family could come for a visit, even though it was a short one. Mom: So, I have good news and bad news. Me: Oh no. What's wrong? Mom: Well, the bad news is, we threw your bassinet out years ago. It was kind of a piece of crap. Plus, it got left in the garage and the cats were camping out in it. I promise, you didn't want it. Me: Oh well, that's not a big deal at all, we can get a bassinet easily. Is that not the most gorgeous thing you've ever seen?! My Dad built a cradle for all of his grandchildren, and Baby B will get to try it out first. To say that I boo-hoed is an understatement (Mom did too). This cradle is seriously GORGEOUS. The pictures absolutely do not do it justice. They bought the mattress already, and Mom and I went and registered for some cradle sheets while she was here. She is having the bedding made of white eyelet material. I am so touched that Daddy did this for us, and I know that generations of grandchildren to come will use and love it. I know we will cherish it forever, and I'm so thankful that he built it. Can't wait for baby girl to use her new cradle from PawPaw Eaker! How special is that?! Your Dad is so great. Beautiful! Can't wait to see your sweet baby in there!